Design Stone Gallery was established in the year 2004. We are new to Pasadena, California, yet not new to the areas of stone, tile and design. The ownership has been in the natural stone and tile businesses for an excess of ten years! Our location, showroom design, custom installations throughout, wide variety of unique, quality materials, and careful attention to our customerï¿½s needs, speaks volumes about Design Stone Gallery as a whole. We are open to the general public. We invite all Designers, Architects, Contractors, etc. to stop by our showroom and take a look around at the unique selection of stone and tile we have to offer. Our friendly staff includes experience in space planning, conceptual design; color theory, material selection, Auto CAD, Architectural Desktop, construction documents, trend analysis, etc. Design Stone Gallery employees are Interior Design students who have been carefully selected for both their design, and sales abilities. Being student members of the Architectural and Design organizations, proven design experience, and sincerely caring about the Architectural and Design community as a whole, our staff has been an excellent choice to best accommodate the needs of our customers! 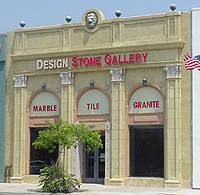 Please note that Design Stone Gallery currently holds INDUSTRY PARTNER / AFILLIATE memberships with The AMERICAN SOCIETY OF INTERIOR DESIGNERS (ASID) Pasadena chapter, as well as THE AMERICAN INSTITUTE OF ARCHITECTS (AIA) Los Angeles Chapter, INSTITUTE OF STORE PLANNERS (ISP) Southern California chapter, and NATIONAL KITCHEN AND BATH ASSOCIATION (NKBA) Southern California chapter. Design Stone Gallery can help you make your visions a reality! Stop by our showroom today!